In order to join the IMPERIAL FORCES, converse with your local recruiter or pilot trainer. They might allow you to join! If you decide to resign it will take 5 mins and to switch factions 5 days, before the traitor can join the Rebellion! The Galactic Civil War is vast in scope, and players from every galaxy have flocked to the front lines. Leaders are needed from both sides to provide leadership, planning and coordination of war activities across the 148 theaters of operation, spanning 10 planets and 8 space zones. This week, we explain the details of the GCW Regional Defense feature, so that all players may have a greater understanding of how the program is applied and how benefits are calculated. 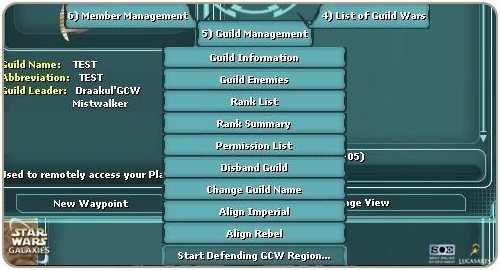 The guild leader can set the guild's factional alignment from the guild management terminal. There is a one day waiting period to switch the guild's factional alignment. There is no waiting period to align with the same faction that the guild most recently aligned with. The guild's factional alignment is displayed in the guild status window. The mayor and guild leader of a factionally aligned city and guild with at least 10 guild members can use the city/guild management terminal to select one of the 148 regions to defend. There is a one day waiting period to switch regions. There is no waiting period to defend the same region that the city/guild most recently defended. The city/guild region defender information is displayed in the city/guild status window. The "GCW Region Defender" radial menu on the war terminal/intel pad will display more detailed region defender information for all the 148 regions. The time that a city/guild started defending a region is only reset when the city/guild starts defending a different region. If the city/guild stops defending a region, and then later resumes defending it (even as a different faction), the time that the city/guild started defending a region is preserved. The Region Defender bonus is only available once the city/guild has defended the region for at least three days. Each region has a fixed 20% bonus. The bonus is divided proportionately between the 2 factions based on the percentage of the GCW score for the region. The proportionate amount that each faction gets is then divided evenly by the total number of cities and guilds currently defending the region for that faction to arrive at the final bonus value for that faction. The final bonus value is applied to all the citizen's/guild member's personal GCW points earned, provided the citizen/guild member is the same faction as the city/guild and earns the GCW points while in the same region that the city/guild is defending. The final bonus value is applied to all the citizen's/guild member's GCW score contribution to the region the city/guild is defending, provided the citizen/guild member is the same faction as the city/guild and makes the contribution while in the same region that the city/guild is defending. If both the citizen's/guild member's city and guild are defending the same region, only one bonus will be granted. 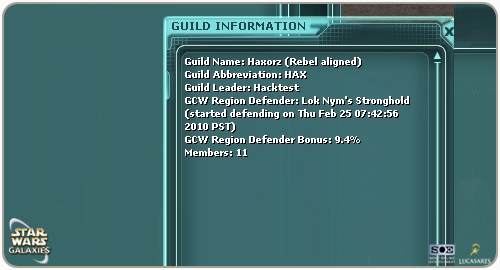 The final bonus value is displayed in the city/guild status window and the "GCW Region Defender" information window from the war terminal/intel pad. The Region Defender title is only available if the citizen/guild member is the same faction as the city/guild, the city/guild has defended the region for at least 3 days, and the faction has at least 70% control of the region. The RebelWarRoom and ImperialWarRoom chat rooms will be created by the system. Only same faction aligned mayors and guild leaders of same faction aligned cities and guilds with at least 10 guild members can enter these rooms. 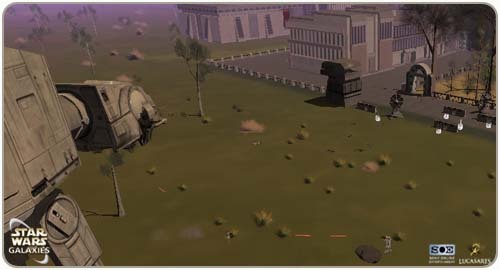 We hope you look forward to experiencing the Region Defender aspects of GCW coming soon to Star Wars Galaxies. Turrets were not firing out to 64 meters due to their detection region being rounded down below 64 meters and using locations instead of objects. Mini-Turret added to faction recruiters for purchase. Mini-turrets are purchased in stacks of 10 for 250 tokens, last 1 minute when dropped, and do 250-500 damage. 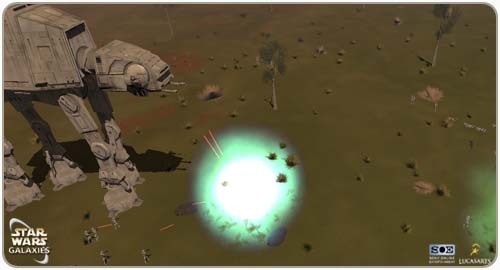 Mini-turrets target factional enemies and do not grant experience and do not grant GCW points. Imperial Command Hat is a wearable for only humans. Turrets should shoot up to 64 meters. Doing destroy duty missions while Special Forces will give you additional 50% mercenary tokens. Rumor has it that Watto will trade certain illicit items for mercenary tokens. Reduced the factional spawn rate slightly in areas where force sensitive mobs are spawning. The war intel pad will now repeat the last action it performed when the Use action is selected. This means that when used from the toolbar, it will repeat the last action it performed. The Naboo System, Naboo System Player vs. Enemy, and Naboo System Player vs. Player GCW region/category contribute to the planetary score for both Naboo and Rori. The Corellian System, Corellian System Player vs. Enemy, and Corellian System Player vs. Player GCW region/category contribute to the planetary score for both Corellia and Talus. 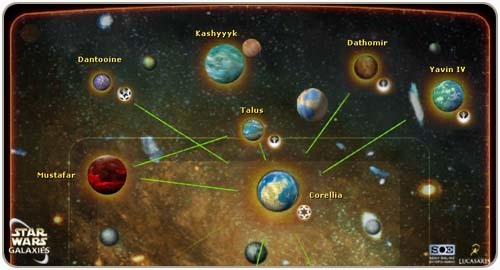 The "weight" of the GCW score category for the 8 space zones (Corellian System, Dantooine System, Dathomir System, Endor System, Karthakk (Lok) System, Naboo System, Tatooine System, and Yavin System) has been adjusted to contribute 5x more to the planetary and galactic score than the other GCW score categories (which will each contribute 1x). In general, the 3 space GCW score categories for each of the 8 planets with an associated space zone (space zone 5x, space zone PvE 1x, and space zone PvP 1x) contribute approximately 30% to the planetary and galactic score. If you are aboard an overt factional ship (can be pilot or passenger), "actively" playing the game, not incapped/dead, of the same faction as the ship (can be on leave, combatant, or special forces), and in a space zone associated with a ground planet (Corellian System, Dantooine System, Dathomir System, Endor System, Karthakk (Lok) System, Naboo System, Tatooine System, and Yavin System), each minute, for risking life and limb to provide factional presence/patrolling the space zone, you will automatically provide a nominal amount of points to the GCW score for your faction for the space zone GCW category of the associated ground planet. If you are in the pilot seat, operations chair, or turret, the amount of points contributed is proportionate to the pilot skill, plus a 10% bonus for each GCW rank. If you are not in the pilot seat, operations chair, or turret, the amount of points contributed is proportionate to the character level, plus a 10% bonus for each GCW rank. The same aligned city bonus (100% bonus, plus a 10% bonus per city rank, plus a 5% bonus per year of city age) is granted if the character's citizenship city is located on the corresponding ground planet and is same faction aligned as the character. If the character's citizenship city is located on Rori or Talus, it will be associated with the Naboo System or the Corellian System, respectively, in determining the space factional presence same aligned city bonus. Space factional presence and contribution are displayed in the "GCW Factional Presence" and "GCW Personal Contribution" window of the War Terminal and the War IntelPad. There is a 1 day wait to switch the guild's factional alignment. There is no wait to align with the same faction that the guild most recently aligned with. The mayor and guild leader of factionally aligned city and guild with at least 10 guild members can use the city/guild management terminal to select one of the 148 regions to defend. There is a 1 day wait to switch region. There is no wait to defend the same region that the city/guild most recently defended. Region defender bonus is only available once the city/guild has defended the region for at least 3 days. The fixed 20% bonus is divided proportionately between the 2 factions based on the percentage of the GCW score for the region. Region defender title is only available if the citizen/guild member is the same faction as the city/guild, the city/guild has defended the region for at least 3 days, and the faction has at least 70% control of the region. Once the title is available, the "GCW Region Defender - City" and/or "GCW Region Defender - Guild" title(s) will be available in the title drop down list. The title will display "Defender of (region name)" ingame. 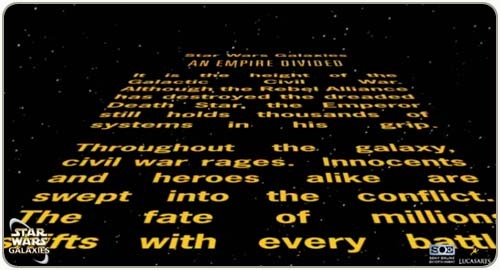 The "Rebel War Planner" or "Imperial War Planner" title is available to same faction aligned mayors and guild leaders of same faction aligned cities and guilds with at least 10 guild members. Tatooine – city of Bestine: The capital of Tatooine is rife with corruption and political turmoil, and is also a key Imperial outpost. If we take and hold this city we will control a wealth of information that moves through the galactic underworld. Talus – city of Dearic: Another capital city plagued by dirty politics and scandal, Dearic is also home to a diverse and bustling Starport. Control of this city provides a broad spectrum of intelligence that will span the entire galaxy. Naboo – city of Keren: As the Emperor's home world, Naboo is the beating heart of the Empire. To establish a control point on this planet would not only supply access to crucial intelligence, but would also be a devastating blow to Imperial morale and the Emperor himself. With its high level of commerce and financial influence throughout the Naboo system, Keren is the perfect target for this operation. This mission takes top priority. The Empire must not be allowed to hold these cities. Good luck, and May the Force Be With You! Imperial Intelligence has confirmed the authenticity of this transmission. Squadrons will be assigned to deliver ground invasion forces to each of these locations to take and secure the cities. Under no circumstance can we allow these Rebel scum to gain a foothold. Be advised that Lord Vader himself has taken a personal interest in this matter, and failure will not be tolerated. The Galactic Civil War is being introduced with Update 15. With this update, your GCW points are directly responsible for control of cities, planets, and the galaxy. You will see these changes reflected on your planetary and galactic maps. Bestine on Tatooine, Dearic on Talus, and Keren on Naboo have been turned on for the new invasion system. Bestine The Defending General can be found inside Bestine at -1214 -3626. An Officer giving defending players quests can be found not far from the General at -1195 -3620. The Defending General can be found inside Dearic at 479 -3007. An Officer giving defending players quests can be found not far from the General at 478 -3023. The Defending General can be found inside Keren at 2131 2766. An Officer giving defending players quests can be found not far from the General at 1787 2512. 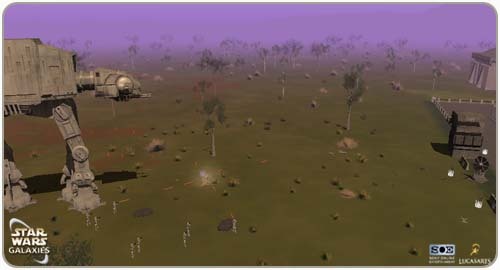 Offensive Camps can be used by the invading faction for invasion specific quests, entertaining players, recruitment, and cloning. Bestine Camps for the invading faction can be found just outside of Bestine at -900 -3782, -1253 -3348, and -1184 -3821. Camps for the invading faction can be found just outside of Dearic at -2 -2805, 355 -2605, and -890 -2994. Camps for the invading faction can be found just outside of Keren at 1820 2192, 2131 2766, and 1212 3054. Tools: Tools must be constructed to make pylons. Their resources are available from a supply terminal near the offensive and defensive general. Supply terminals may be sliced by smugglers to provide optional components. Slicing the terminal repeatedly will increase the quality of the optional components. Pylons are construction points where you get construction quests. Pylons are constructed by tools, which trade skill players manufacture. Anyone may use a tool, but trade skill players are the most effective at using tools during construction. Constructing a pylon fatigues the builder, causing the construction of pylons to take longer and longer. This can be eliminated by visiting entertainers to work off fatigue. Some Pylons have 4 levels: Level 0: No construction and will not spawn during the battle. Level 1: 1-49 resources have been constructed on the pylon. Level 2: 50-99 resources have been constructed on the pylon. Level 3: 100 resources have been constructed on the pylon. Soldier Patrol: This object spawns NPC's and is represented by a helmet icon floating over it. Defensive patrols stay entrenched at their constructed location. Offensive patrols assault defensive positions. This object guards nearby players and NPC's and is represented by a barricade icon floating over it. Turrets are AI controlled and fire at enemies nearby. The pylon for these is represented by a gun barrel or dish icon floating over it. Towers buff non-player controlled AI nearby to do incredible amounts of damage. The pylon is represented by a floating tower icon over it. Vehicle patrols spawn tough vehicles and are represented by a terminal icon floating over it. Pylons are converted to their corresponding object when the construction phase ends and the battle phase begins. Entertainers may entertain patrol points to buff NPC's spawned for both invasion and defense of a city. Patrol points may be sabotaged by spies, which require a quest from their faction's general/attaché. No levels, but HP is increased by 5000HP per resource added. Barricades offer defender quests for general combat. Level 1-3: Increased damage per shot, but it can be mitigated by armor. Turrets offer defender quests for general combat. Offer a quest to revive fallen soldiers to medics. Will reinforce a location or begin patrolling into the city to add to the invasion force. Offer a quest to tradeskill players for repair. Once repaired, they will reinforce the invading force by patrolling into the city. Offer a quest to entertainers to be entertained and rejoin the battle effort for both offense and defense. Invasions occur every three hours and last an hour. Two of the three cities will be active during each invasion. The construction phase lasts 30 minutes. The battle phase lasts 30 minutes. Defeating a defensive general will end a battle with the offensive team as the victors. Keeping the defensive general alive for the entire battle phase (30 minutes) will allow the defending team to win. Defensive general will flag players as Special Forces, if they persist in attacking him. A warning window will be displayed for attacking a general and not being Special Forces. The Planetary Map for the appropriate planet will show the current phase that Bestine, Dearic, or Keren is currently in (construction, combat or occupation). Neutral players can become factional helper to help their favorite faction. Use the command browser, /factionalHelper slash command, a faction recruiter, an invading city General or a city defensive Field Commander NPC to access the factional helper system. There is a 30 minutes cooldown once you have stopped helping one side before you can start helping the other side. You can still immediately help the side that you most recently stopped helping. If you are a Special Forces factional helper, you will be automatically changed to Combatant factional helper upon cloning. If you are factional special forces (NOT factional helper special forces), "actively" playing the game, not cloaked/incapped/dead, and out in the world in a GCW contested region, each minute, for risking life and limb to provide factional presence/patrolling the GCW contested region, you will automatically provide a nominal amount of points to the GCW score for your faction for the contested area. The amount of points is proportionate to the character level, plus a 10% bonus for each GCW rank. Factional presence is only granted if you (or if mounted, your vehicle/mount) are on the ground out in the world. This means that factional presence is not granted if you (or if mounted, your vehicle/mount) are in/on any part of a structure (like entrance steps, roof, balcony, theater stage, etc), or on a bridge, or in a garden, or in the bazaar/bank plaza, or on a storyteller platform, etc. 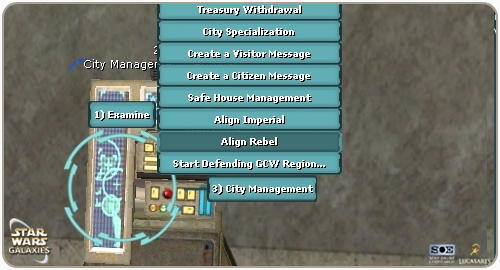 A "GCW Factional Presence" radial menu has been added to the War Terminal and the War Intel Pad that displays a window showing the GCW contested regions that currently have factional presence activity. The mayor can set the city's factional alignment from the city's management terminal. There is a 1 day wait to switch the city's factional alignment. There is no wait to align with the same faction that the city most recently aligned with. The city's factional alignment is displayed in the city's status window and in the announcement message when you enter the city's borders. If factional presence (see above) occurs within the borders of a same aligned player city (i.e. the player city overlaps the GCW contested region, and the factional presence occurs in the overlap area), there is a 100% bonus, plus a 10% bonus per city rank, plus a 5% bonus per year of city age. Once a planet is 70% controlled by a faction, the following travel perks and restrictions will apply to GCW officers. To repeat, GCW travel perks and restrictions only apply to GCW officers. GCW officers of the controlling faction will have 0 shuttle wait time. GCW officers of the losing faction can only board every other shuttle, or pay a 50000 credits surcharge (each time) to avoid waiting for every other shuttle. GCW officers of the losing faction must pay a surcharge for shuttle travel if either the departure or the arrival planet is 70% controlled by the opposing faction, whichever is greater. The amount of surcharge is 500 credits for each % above 70%. If the planet has more than 1 Starport, only 1 Starport will be available for interplanetary ticket travel (both outgoing and incoming) to GCW officers of the losing faction. The 1 Starport that is available is the one that is least controlled by the controlling faction. 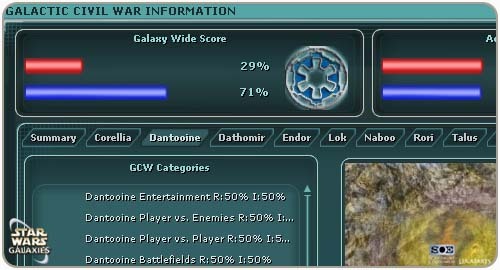 The Galactic Civil War Information Screen: A new button has been added to the button bar. The Galactic Civil War screen is THE location to get all the information you need to see what's going on in your part of the world, or how the war is going in other galaxies and the final score across all galaxies. This screen can also be brought up with the /gcwInfo command. The planet map has been updated to show areas that affect the outcome of the Galactic Civil War as well as the score for that current zone. 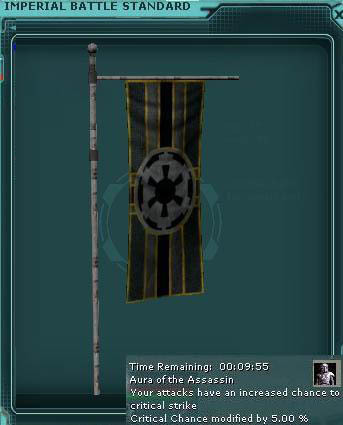 Areas currently under rebel control will show up as a rebel insignia, imperial control shows up as an imperial insignia, and 50/50 zones are shown with a contested insignia. You can prevent the Galactic Civil War zones from showing up on your planet map by simply unchecking the "Show GCW Contested Zones" option on the Planet Map window. Spawns will now be affected by a regions GCW score. The higher the score is in a region, the more likely you will be to see troops from the faction that is currently winning. There are new collections tied to the GCW city invasions. GCW points directly affect some planetary spawns and are properly represented on the war terminal. Mon Calamari Cruisers or Star Destroyers will appear in the sky of a planet, depending on who is winning. The more your side is winning by, the more ships you'll see. Replaced the original two story battlefield bunkers with reworked single story bunkers to address the line-of-sight issues caused by pvp'ing in those buildings. Frame rate limit increased from 30 to 60 FPS. Storyteller vendors can now offer most props and NPCs in larger quantities when purchased. Sniper shot no longer requires a prone position. Pistol Launcher rocket trail particle density reduced. Tusken Raiders from the Tusken King instance will now count towards 'Kill Tusken Raiders' and 'kill and loot Tusken Raiders' storyteller relics. 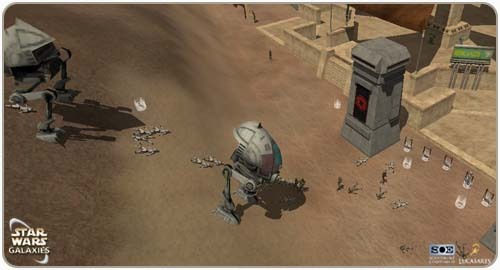 Greater Desert Womp rats should now count towards 'Kill any Womp Rats' and 'Kill and Loot any Womp Rats' Chronicle Relics. Targets you cannot attack (such as same faction NPCs) will now display their health as a grey bar when targeted. You still cannot attack these NPCs, merely observe their health. Added a checkbox on the character selection screen to hide characters screen on servers that are now closed. Players may now equip as many cybernetic attachments as they wish. Now you can be the droid you're looking for! The Allow Object Icon Rotation option now applies to toolbar icons and not just inventory/container item icons. Export command now properly writes out font colors. Players can now mark themselves as "Looking For Work" (either by using the command /lfw or checking the LFW option on the Character tab in the Community page). This tag is meant for players who wish to do commission based work or provide some type of service. You can search for players with this tag by using the community search tool. No-Trade items can now be placed into containers inside a player's house or space POB. 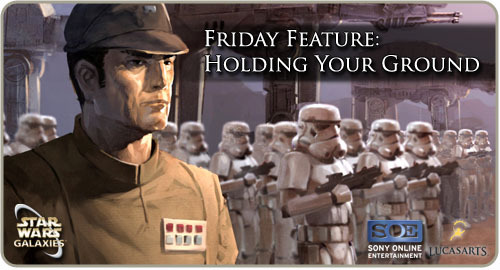 It's Star Wars Galaxies. It's an empire divided. It's our passion. And, it's a galaxy at war. This update will bring with it the most engaging GCW content we have ever put into the game. AT-ATs will take siege upon the cities. Every profession must be ready to participate and fight for their cause. GCW information will be at your finger tips. This is the one-stop-shop for everything that is GCW across all Galaxies. Has the rebellion taken over Yavin IV or are the imperials holding them off? What faction is dominating Tatooine? Hit the galaxy map and you'll find out. Have we lost Tatooine? What's the status of Bestine? Has Mos Eilsey fallen to the Imperials? Is Anchorhead still a rebel stronghold? Check the planet map and find out. Contribute to the GCW from anywhere in the game not just these regions. Battles in space will make an impact on the conflicts on the ground. We will bring the entertainers and traders back to the cities. The cities will be alive again. 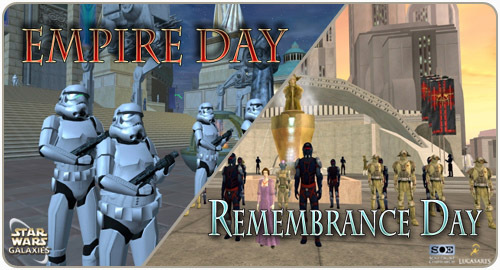 The Empire Day and Remembrance Day celebrations are back! The tension heats up between the Alliance and the Empire again. Both factions are recruiting members to help post propaganda and tear down whatever propaganda the other side managed to post. Entertainers are recruited to boost the troops' morale, while Traders are hired to help keep supplies flowing to the front lines. 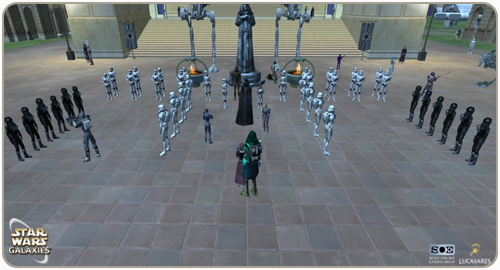 Imperials seek out, in Theed, Major Brenn Tantor for Propaganda Quests, Droid Kaythree for Trader and Entertainer Quests, and Mara Jade for Combat Quests. Rebels seek out, in Coronet, Captain Derlin for Propaganda Quests, Major Carlist Rieekan for Trader and Entertainer Quests, and Wedge Antilles for Combat Quests. This year there are new badges and collections plus some new rewards including the AT-ST and AT-XT vehicles. Time to get busy! Mara Jade and Wedge Antilles have a new way to show their appreciation for their fans so make sure to visit them! The count of the number of bases reported in the War Terminal/War Intel Pad/War Table should now be accurate. The cap of the number of bases allowed per planet should now be correctly/consistently enforced. This year's Empire Day is stacking up to be a very memorable event. We're bringing back the event from last year and have added many new features to ensure it is as exciting if not more so, than our past three events. Enhancements were made to the entire event from last year. We have added a slew of new rewards and interactive content. Here is a quick overview of some of the things you can expect to experience during Empire Day. The ceremonies are back in the same locations as last year; Imperials will be gathering in Theed while Rebels will be assembling in Coronet. The ceremonies themselves have been expanded with more troops and enhancements and now occur approximately every 15 minutes as opposed to the hourly ceremonies held last year. This means less waiting for your player to be picked and more time to participate in other Empire Day activities. 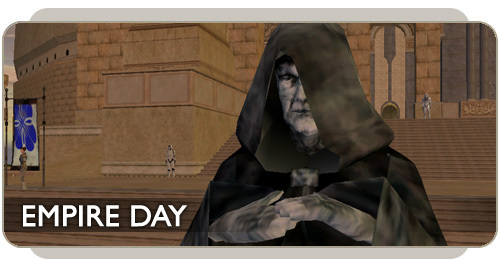 As with Life Day, the player will participate in activities through which you will earn event tokens that can be used to purchase Empire Day specific items. These items are available from the ceremony organizers between ceremonies. Darth Vader will yet again be calling loyal players out of the crowd and presenting them with a brand new badge/title for 2009. Instead of just calling one person out of the crowd, as they did last year, they will be calling three players out at each ceremony. These chosen players must bow before the presenters to receive their reward. In an effort to draw citizens over to their respective sides, the Empire needs help displaying propaganda posters around Theed and Coronet. Players will be able to help their faction by posting propaganda on unmarked kiosks throughout the cities. Players who do this while flagged as Special Forces will receive an additional token bonus for their deeds each time they participate. With both factions vying for attention, neither side can rely on their posters do the job; they must also tear down the posters put up by the opposing faction. 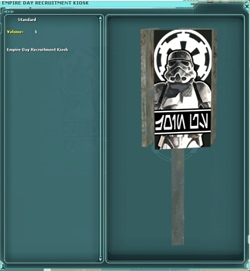 Players can help their faction by tearing down the rival propaganda posted around Theed and Coronet. Again, players who participate while flagged as Special Forces will receive an additional token bonus for their contribution each time they participate. 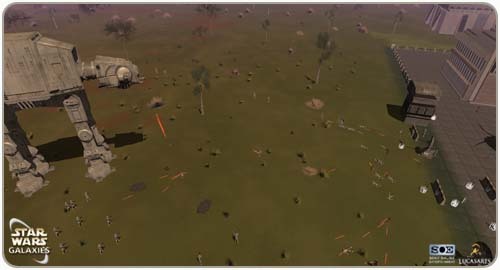 Both Entertainers and Crafters will have missions specifically designed for them so that they may add their own unique talents to this year's Empire Day. Entertainers will need to go perform for specific groups of soldiers in six different cantinas across the galaxy. Crafters will be asked to contribute to their faction's cause by raiding certain shuttle crash sites for materials and creating needed items. Collections will be directly tied to Event and Quest activities already mentioned. Once complete, players will be rewarded with event tokens, GCW Points, badges and in some cases, new titles. Several new rewards have been added to the event this year. 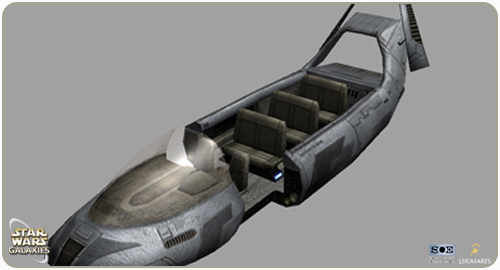 One of the most exciting is the Tantive-IV landspeeder, the first eight-passenger vehicle available through regular in-game means. This vehicle has been a highly desirable and often requested multi-player ship and we could think of no better time or opportunity to give it to players – another great reason to join the Empire Day celebration. 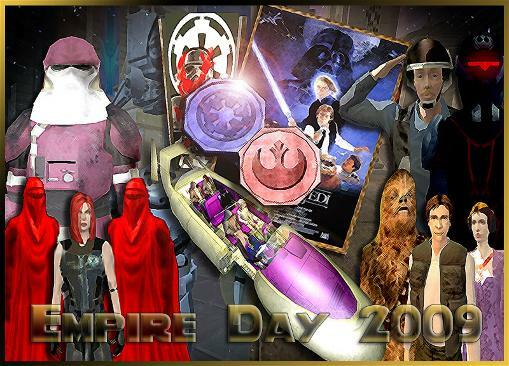 Empire Day is a galaxy-wide celebration that marks the Emperor's rise to power and founding of the Galactic Empire. 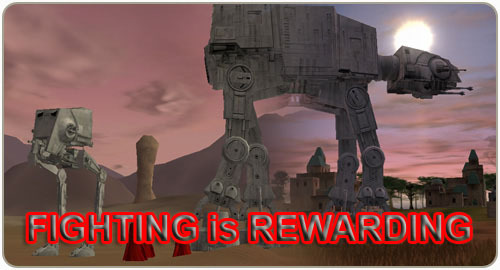 This year's event, beginning on June 26, also commemorates an amazing five years of Star Wars Galaxies with in-game events for everyone to support their faction and join in the celebration! 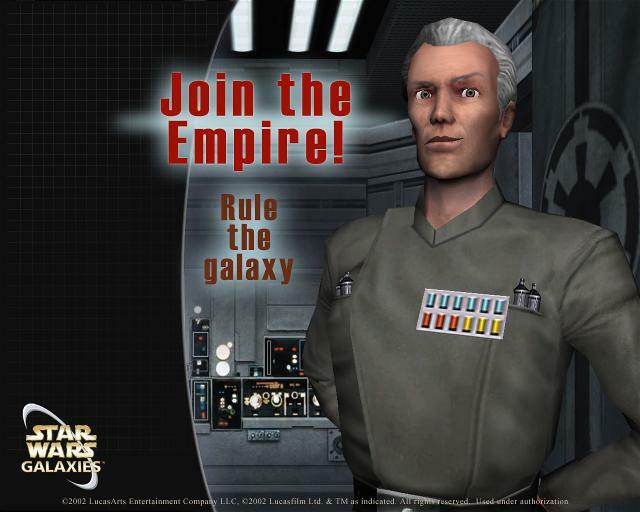 Empire Day is celebrated throughout Imperial-controlled space to commemorate the creation of the Galactic Empire. The actual "day" of this holiday is marked according to Imperial Center time, but celebrations can last days or weeks depending on culture and location. Due to the vast and varied worlds controlled by the Empire, beings on many worlds celebrate in different ways. Some just wish to be near the Emperor himself, though they don't expect to see him. Others simply gather with friends and kin and have private celebrations or other contests, marking the day with festivities and fun. 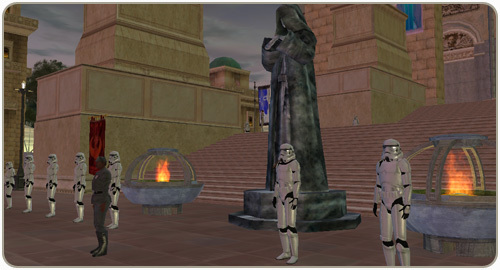 This year loyal citizens of the Empire can choose to pay homage to an imposing statue of the Emperor in the city of Theed . This commanding figure rests near the steps of the royal palace and at its base a small army of stormtroopers stands at attention. The Imperial Celebration Organizer, who can also be found in the shadow of the statue, offers Imperial-issued rations for sale to mark the occasion. Order 66 Cookies increase movement and grant an experience bonus; these crunchy cookies have a delightful aftertaste. Imperials also enjoy the Gracious Government Mix during Empire Day celebrations. These delicious chocolates increase damage and reduce action cost. The Organizer is highly trained to sniff out Rebels in disguise and does not sell his wares to any Rebellion sympathizers. These treats will disappear fifty minutes after purchase, so consume them quickly. 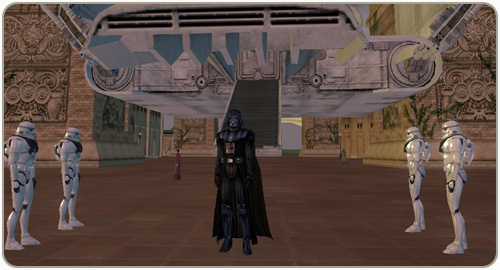 Darth Vader and a legion of Dark Troopers are also descending on Theed during the celebration. 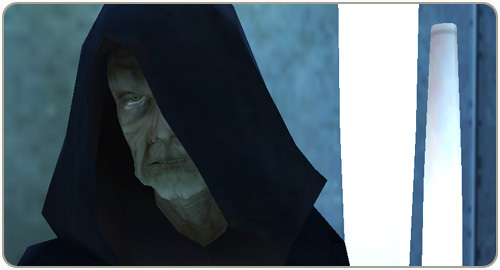 Citizens of the Empire can catch a glimpse of the Dark Lord once an hour as he addresses the citizens congregating at the steps. Each hour, Darth Vader recognizes one lucky Imperial citizen for his or her contribution to the Empire. Pay your respects if you are called upon and the Empire will recognize your deeds in front of the gathered crowd with an Empire Day badge. Earn GCW points and tokens and gain new military ranks and perks! Enlisted Ranks don't face rank decay! Officers are on active duty and active participation in the war is a must! You are subject to rank decay once you reach the officer ranks (Lieutenant and above). Failure to meet the requirement for rank decay will result is lost progress towards general. The farthest you can be demoted to is 99.98% progress towards Lieutenant. There is a limit on how much rank progress that can be achieved each week. A proc effect where you have the chance to attack the enemy back each time you are damaged. Usually about 200-300 damage. * Note: Does not work for heavy weapons. You receive a 7500 heal upon incapacitation followed by a short buff where you receive 100% avoidance for 5 seconds. All allies within 50m radius receive +200 to agility, +120 to constitution and +750 to energy and kinetic armor buff. 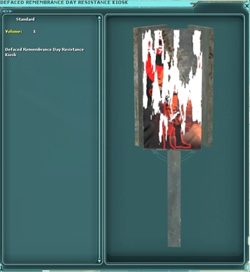 Means to obtain: On sale at the factional recruiter, only for Imperial Generals. The credit cost is determined by the current planetary possession on the planet the recruiter is located on. This ability cannot be used indoors. This is an area of effect attack, that does damage centered on your target at the time you clicked this abilty. The galaxy is in turmoil. The oppressive Empire nearly has complete control of the galaxy, and only a small, ragtag band of Rebels opposes the evil New Order. The Rebel Alliance has recently scored a major victory by destroying the dreaded Death Star, but the Empire is still relentlessly pursuing Princess Leia, Luke Skywalker, and other Alliance leaders. 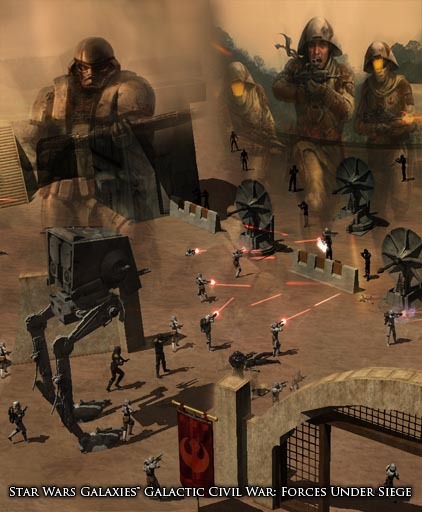 The Star Wars Galaxies™ Player-versus-Player combat system (or PvP) allows players to fight one another within the context of the greater Galactic Civil War. PvP combat is not enabled by default; instead, you must actively choose to participate in the PvP system and make yourself vulnerable to attacks by other players. AS IF THE GALAXY WASN'T DANGEROUS ENOUGH ON ITS OWN, THERE'S NOW A FULL-SCALE WAR GOIN ' ON .... ON ONE SIDE, YOU GOT THE EMPIRE. THEY HAVE MILLIONS OF TROOPS, BIG TECHNOLOGICALLY ADVANCED WEAPONS, CONTROL OF THE GALAXY'S RESOURCES, AND A BRUTAL ENFORCER NAMED DARTH VADER ... JUST ABOUT EVERYTHING YOU NEED TO WIN A WAR. AND THE REBELS? WELL, THEY HAVE COURAGE. 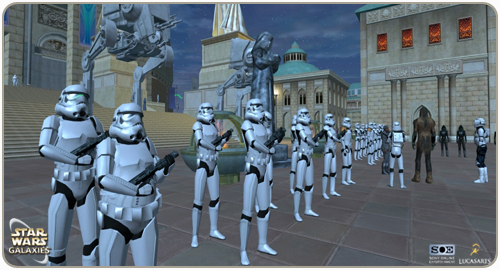 The two warring groups in Star Wars Galaxies are the Rebel Alliance and the Galactic Empire. You can join either side in the conflict. However, doing so requires a bit of work: you can' t immediately declare yourself an Imperial or a Rebel. Complete Rebel or Imperial Missions: Throughout the game, you' ll discover special mission terminals that provide faction-specific missions. By completing a mission acquired from one of these terminals, you can increase your faction standing with the specified faction. Some NPCs in the game might also be able to provide faction-specific missions. Once you' ve earned enough faction points (200), you can visit a recruiter to actually join your desired faction. Rebel and Imperial recruiters are stationed (or hidden) in various cities throughout the galaxy. Covert: Declaring as a covert member of a faction allows you to participate in limited PvP. As a covert member of your faction, you' ll be allowed to attack enemy NPCs (such as stormtroopers, if you join the Alliance). Overt: Overt status is true, constant PvP. As an overt member of a faction, you can attack any enemy NPCs, as well as overt members of the opposing faction. Even after you join the Empire or Rebel Alliance, faction points remain extremely important. You can "spend" faction points for specific perks. 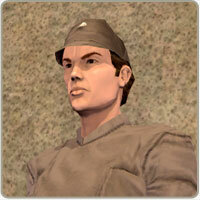 These include access to special weapons, uniforms, schematics, deeds, followers and ranks. As a covert member of a faction, you will often incur Temporary Enemy Flags (or TEFs). You can gain a TEF by attacking an NPC or by aiding an overt member of your faction (through healing, for example). While the TEF is active, an overt member of the opposing faction can freely attack you. If you decide you no longer want to be a Rebel or Imperial, you merely need to find a recruiter and converse with that NPC. You will be offered the choice to leave the faction. However, you can't join the opposing faction until you earn enough faction points. You can fight another player by challenging him or her to a duel. Duels allow you to experience short-term PvP without interference by other players, and regardless of your faction. To challenge a player to a duel, press and hold your MOUSE 1 button on the player, and then select Duel from the radial menu. During the current time period, the Empire holds dominion over the galaxy. A small band of rebels struggles to fight against the tyranny of Emperor Palpatine. The war won't ultimately be won until a Jedi named Skywalker confronts Lord Vader and his master. 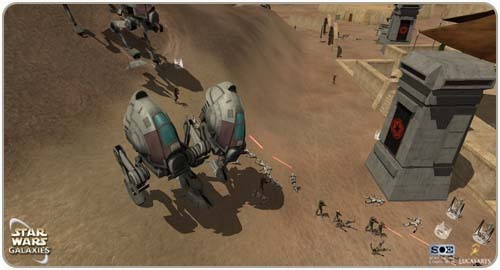 In Star Wars Galaxies however players can have a real impact on the current state of the war. By controlling more Player Faction HQs and NPC Faction Bases than the other side, everyone in your faction will gain an advantage. The losing side will be granted a compensation to help them try to catch up. You can see which side currently has the advantage at any time by typing /GCW. Please note, the game designers will periodically make changes to the advantages and compensations in order to stimulate the war. With enough faction points, players can purchase factional structure deeds from NPC Recruiters. These headquarter structures come in multiple sizes, and each upgrade level offers facilities such as hospitals, mission terminals, recruiters, and so on (See the next section on HQ Types for more information). Players may then place these structures in the world and attempt to defend them from enemies. The headquarters only needs to be defended 2 hours each day (starting at the time it was orgininally placed down). Having more active player bases than the opposite faction scores your faction points towards the overall Galactic Civil War. 6) Prevent the HQ from "shutdown" activate-able by any defending declared player. If the defenders are successful in the shutdown, there is a 5min "reboot sequence" before you can attempt step 5 again. Controlling Factional NPC Bases is similar to the Player bases except that they don't necessarily involve PVP and they can be found in static locations. The banners and spawned NPCs will indicate which side currently owns the base. There are several different types of factional HQs that can be placed by Overt members of a faction. These bases count against that players total lot allowance. When a base is placed down, it is open to attack by the enemy for the next 2 hours. After that it will be safe for 22 hours. This means that at every day at the same time, the base will be "vulnerable" for 2 hours and safe for the rest of the day.